Dr. Berry’s™ Ageless Therapy Oil assists in naturally smoothing and toning ageing, sagging and wrinkled skin on the face and body. 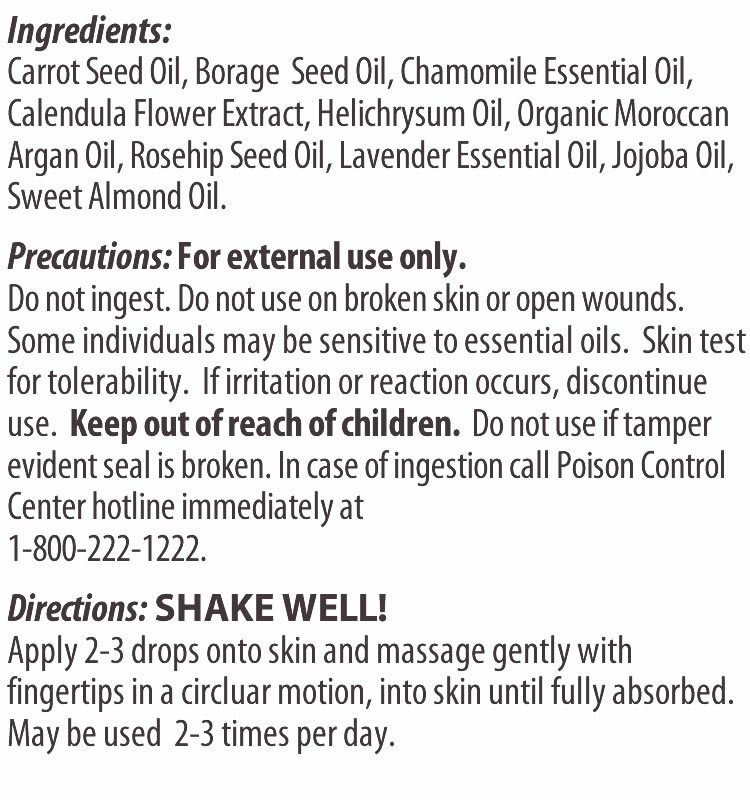 Carrot Seed Oil is a premier skin healing oil. It’s high carotol content gives it skin rejuvination properties. Borage Seed Oil helps heal inflammation of the skin and promotes skin health. Chamomile Essential Oil increases the ability of the skin to regenerate and acts as and anti-inflammatory. Calendula Flower Extract is used to heal skin and reduces inflammation. Helichrysum Oil is known for it’s properties of nerves regeneration, improving skin conditions, and reducing inflammation while speeding healing. Organic Moroccan Argan Oil is considered remarkable for mature skin. Argan oil is highly resistant to oxidation and contains high amounts of natural vitamin E.
Rosehip Seed Oil has traditionally been used for reducing signs of sun damage, premature aging and scaring in the skin. Lavender Essential Oil has traditionally bee used as an anti-inflammatory, balancing, relieves pain, calming, relaxing. Sweet Almond Oil is great for all skin types as an acting emollient and is best known for its ability to soften, soothe, and re-condition the skin. I have spent the last 2 years buying products for my damaged skin from active Grover's Disease. I had purchased a soap and I received a little bottle free. I am not using it for age I am using it to help heal my skin. I purchased 4 big bottles and plan to continue to use it . Also if you have very dry skin great product. Finally a product that works for me..